Among today’s businesses, many are opting for a more open office layout. 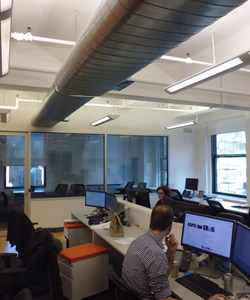 The open office layout is believed to promote teamwork and save on construction. 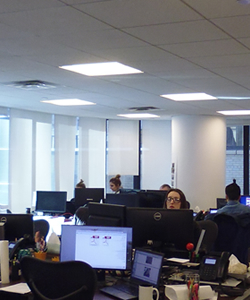 The recent question is if an open office layout is truly beneficial. A successful office layout achieves maximum productivity and efficiency while maintaining profitability. The ideal office environment is depending on the type of work and business you are developing. The office layout is important to your business's brand and an important decision to consider. The separation of public and private workspace should emulate the business and the product. Deciding an office layout best suited to your business has many factors to consider maximizing the office space. In many business environments, employees spend considerable amounts of time at work and at their desk. Fostering a specific business culture is vital to the overall office environment. A great office environment can influence employee productivity, organization, and morale. While functionality of an office layout is important, employee workplaces should also be comfortable. To create the ideal office layout, altering the existing design and adding new design will ensure functionality. Elevating your office space to serve the business should consider all the equipment and accessories needed to function. When employees’ working concerns conform to the office layout, your business will experience growth and forward movement. Designing the office layout with employees in mind prove to function more efficiently and organized. Workflow takes into account the procedures necessary to complete a task effectively and timely. When designing the office layout, it is important to assess the time and process of task completion. To run at maximum efficiency, determining the workflow of task completion can assist in designing the ideal office layout for your business. The office layout should function to assist in the flow of information. Social interactions, telecommunications, and paper distribution should be considered when designing an office layout to ensure smooth office operations. Employee needs are important to address when designing the office layout. Providing employees with comfortable accommodations, space, and devices to work more effectively is a great start to addressing their needs. The layout should group together employees based on their jobs, needs, functions, and tools needed to complete a task. An ideal office layout should accommodate the employees with enough space to place any necessary documents and materials. An important element in an office layout is allowing for the ease of social interactions and dispersing of ideas between co-workers. While creating an ease for social interactions, many businesses are concerned with disrupting concentration or privacy. A well thought-out office layout is the foundation for creating an inviting workplace. Catering to the employee concerns, such as space, comfortable furniture, and equipment, improves employee morale. The better employee morale leads to more efficient and productive work days. While addressing employee concerns are important, supervision is another important element. An efficient office layout allows senior staff to be accessible to junior staff for any assistance or training. Senior staff to be productive must focus on their tasks as well as supervise junior staff’s progress and issues. Keeping senior staff accessible will boost productivity and training of junior staff. Furniture and equipment are important elements to the efficiency of a layout. Providing sufficient equipment and furniture for the staff’s work process is important during office layout planning. The placement of regularly used equipment near the workstations and staff is essential. As well as, comfortable furniture and seating for the staff to utilize. Noise is a prevalent distraction in many offices. Noise may be disruptive to the function of the office. Excessive noise hinders communication and concentration. An efficient layout keeps noise and distractions to a minimum while maintaining functionality. Some designs place workstations away from conference rooms, breakout rooms, and other high traffic areas to assist in noise control. One of the most essential elements for an efficient layout is appropriate lighting. Proper lighting has been proved to improve staff productivity. Designing an efficient layout should start with proper lighting to boost the work being performed. Reducing eyestrain assists the comfort and accuracy of the staff while overall enhancing productivity. Air temperature and air quality greatly influence the staff’s comfort. Comfort is one of the key roles to enhancing office productivity. The office temperature and air quality have a positive effect on the staff’s productivity. Designing your office layout with proper air temperature and air quality contribute to the overall efficiency of the layout. Spatial arrangement is important during the planning of an efficient layout. It is an essential key factor to enhance staff’s productivity. Effective spatial arrangement simplifies the flow of paperwork, easily located equipment, and proper supervision. Spatial arrangement also boosts the business’s brand and image. Proper spatial arrangement provides an ease for expansion, reduction, or relocating. Safety considerations are important in many efficient layouts. The layout must provide a safety plan with exits to the staircases, hallways, or fire escapes. Safety exits are integral to a safe workplace and security of the staff. Emergency exits and power backups are necessary to satisfy the any qualifying code. Future expansion should be considered when planning an efficient layout. The layout should be able to accommodate any new hires or additions to the team. The layout’s organization should allow for new hires without losing current productivity. There are many elements and factors to be considered when planning the perfect layout for your business. Do you have any suggestions or questions for the above list? We would love to hear from you!